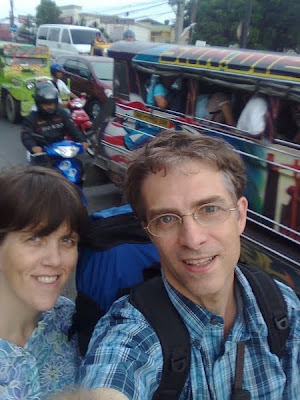 A few days ago Heidi and I put on our backpacks and headed for the Island of Palawan to run the children's program during a NTM field conference. Traveling here is interesting in that you often don't know exactly how your travel arangements will work out. We had purchased plane tickets, but ended up being switched to a different day. When we arrived at the airport they switched us to a different plane in a different airport. The Steven and Ginger Jordan family picked us up when we arrived in Palawan and took us to lunch. Heidi was very happy that Jonathan Jordan warmed up to her very quickly. When we arrived at the NTM mission center we got to work getting ready for the next day's sessions. Steve took me to town to buy some craft supplies we needed and helped me get some bird house pieces ready. Our theme was birds and we made bird identification books. Palawan has more than 170 kinds of birds and people come from all over the world to bird watch there. Most of these kids live in rural areas where their parents are doing missionary work and so they have lots of opportunities to see birds and enjoy that part of God's creation. Heidi had made wings for everyone, so we had several bird games. In the end, everyone had a beautiful bird house and a lot better idea about the birds around them. Our group had 16 children ranging from infants to 10 years old. They were an international group with the United states, Canada, Faroe Islands, and Germany being represented. 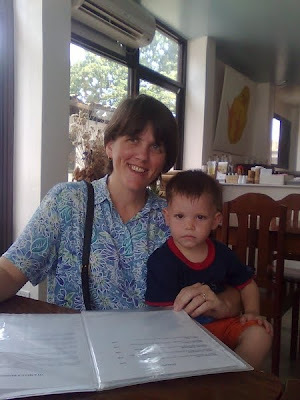 We arrived home safely and Jonathan is gearing up for a translation trip next week to our village. Thanks for your prayers!!! What a fun trip! Birds are a favorite around here; it looks like everyone enjoyed the houses, books, clay birds, and wings! Wow! Talented crafters! How precious! What a great group of little ones, so lucky to have Uncle Jonathan and Aunt Heidi take care of them!!!! Glad you had a great trip, and I know you were a blessing to everyone down there!